The new Crossover Pre-Workout is here! With only 50mg of caffeine, this is a very low-stimulant pre-workout designed to increase VO2 max and make you more efficient. It has been shown to increase oxygen retention and keep the heart rate lower, meaning more work can be done. Crossover is powered by two key ingredients: PeakO2, which studies show increases power output, fatigue threshold and your ability to take in oxygen; and elevATP, which helps support the production of ATP, a critical cellular energy source that primes power output, muscle size and strength and athletic performance. Additionally, other ingredients like coconut water and electrolytes help fuel and hydrate, to fuel more grueling workouts. The harder and longer you can sustain your training session, the faster you’ll see results! Plus, it has no artificial colors, flavors or sweeteners, making it a great choice for those with allergies or those who simply want to avoid artificial ingredients. This product is great for CrossFit-type training, triathlons, Spartan races, Mudders, fitness classes, having better endurance and focus, and getting more output out of your workout. Stance Lipotropic has arrived! This pre-cardio workout drink will take your workouts to a new level. This formula has used studies to determine which ingredients will help you the most with your cardiovascular workout. Stance products are designed with quality ingredients to ensure a healthier supplement for your body. Dicana (3,3’ Diiodothyroacetic acid, protected by US Patent #7,919,533) is fueled by a powerful proprietary combination of patented Diiodothyroacetic acid isomers. These powerful, ground-breaking isomers represent the pinnacle in metabolic regulation as they are metabolically active on their own in addition to having a direct reversible pathways to the fat incinerating T3 thryoid hormone, Tricana, and T2! Dicana is a potent non-stimulant metabolic booster developed to dramatically increase fat burning by raising basal metabolic rate, thus, increasing oxygen and energy consumption by the body. Dicana increases the rate of caloric burning through pro-thyroid mechanics, causing a shift from fat mass in favor of lean muscle. This is accomplished by strategically repurposing calories, increasing muscle protein synthesis while simultaneously annihilating body fat. Dicana is found in the brand-new STANCE thermogenic, as well as the EVOLVE System sold at NUTRISHOP, in the form of DIOXITONE T4. That might seem familiar — yes, it’s referencing the same T4 (thyroxine) mentioned before when we were discussing the important hormones the thyroid produces. Remember, its purpose is to synthesize proteins, which in turn helps build muscle and — wait for it — ultimately leads to decreased body fat. This is how hormones can affect your physique and well-being, and Dicana can play a vital role in the process. The best new four-benefit combination men’s pre-workout product is here: STANCE! With a patented formula designed to help generate a pump, create energy and focus, boost testosterone and burn fat, STANCE is sure to be one of NUTRISHOP’s most popular men’s pre-workout products. The purpose of this article is to explain how STANCE can help you boost your testosterone levels, thus increasing your natural ability to build muscle and burn fat. What makes this product a hit, specifically for men? An ingredient found in similar hit products at NUTRISHOP, D-Aspartic Acid. You may remember it from the powerhouse testosterone booster, 1-XD, and it’s back for STANCE, making it the only pre-workout with a clinically dosed amount of this tested ingredient to boost testosterone levels significantly (42 percent in 12 days, according to one study!). As men age, testosterone production falls — this is the unfortunate truth about this powerful hormone that is responsible for muscle growth, fat loss, and many other positive attributes. During puberty and into the 20s, testosterone production ratchets up sharply, and then it drops off slowly forever, naturally. In the pituitary gland, it stimulates the secretion of the following hormones: prolactin (PRL), luteinizing hormone (LH), and growth hormone (GH) In the testes, it is present in Leydig cells and is involved in testosterone and progesterone release. …Researchers gave a couple of dozen men aged between 27 and 37 a daily dose of 3.12 grams of for twelve days consecutively. Twenty other men were given a placebo. The testosterone level in the subjects that received the supplement had risen by 33% after the twelve days. But STANCE doesn’t stop at being a testosterone booster. Any pre-workout product worth its salt should create a crazy pump and provide focus and energy, and this formula definitely delivers that. For focus and energy, it has 300mg of caffeine and a good dose of Phenylethylamine (PEA). Meanwhile, a clinical dose of patented Creatine Nitrate takes care of the first part. This form of creatine, one of the newest, patented developments in the supplement industry, is on the rise in popularity because of its superiority to creatine monohydrate in a couple areas. The first is water retention. Many athletes find that creatine monohydrate adds size, but at the cost of bloating — biochemically speaking, it forces intra- and extra-cellular water retention. Cosmetically speaking, this causes a soft, smooth, bloated appearance, and more importantly, the water retention may restrict muscle growth by causing a constricting environment that doesn’t allow muscle cells to expand in size. Where creatine nitrate differs is that it expels excess water while simultaneously hydrating muscle cells and saturating them with creatine. Athletes using creatine nitrate as opposed to classic monohydrate should notice a leaner, harder look. Creatine Nitrate, however, is more than just creatine, as the name implies. The nitrate component offers tremendous functional advantages to athletes. And this advantage is sure to reshape the entire nitric oxide and pre-workout nitric oxide category forever. Nitrates provide substantial benefits to athletes and bodybuilders, as supported by clinical research. They are organic anions naturally occurring in the human diet, with close to 80 percent of dietary nitrates found in vegetables. Fruits and processed meats represent additional sources of nitrates in the human diet. In fact, researchers at Michigan State University have suggested nitrates may be nutritious. So what benefit does supplementation with nitrates offer to athletes? In the body, nitrate converts into nitric oxide, and once oxidized, nitric oxide is recycled back into nitrate, which then has the potential to convert into nitric oxide once again. And the cycle continues to repeat itself. This creates an exciting alternative to nitric oxide production, and carries profound implications for the athletic community. A critical problem with nitric oxide is the short lifespan it has in the body. In just a few seconds, the nitric oxide molecule can be metabolized, and the athlete loses any benefit he/she may have received. A pump however must be sustained for several minutes, if not hours, in order to result in those biochemical conditions required to stimulate muscle hypertrophy. And nitrates are capable of elevating nitric oxide production for up to 8 hours. The bottom line on Creatine Nitrate: Nitrates provide a prolonged precursor to nitric oxide production, allowing for a better muscle-building environment in the body. Learn the single biggest mistake people make when going to the gym and how to avoid it! The Newest Nutrishop Stack is available. 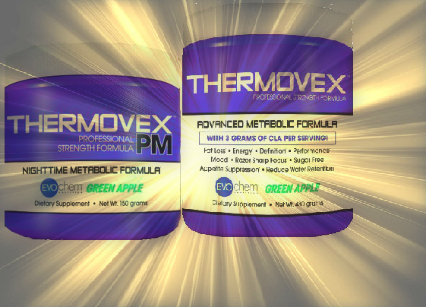 Thermovex PM used in conjunction with Thermovex provides optimal results. Combining these two excellent supplement will allow for quicker weight loss, muscle retention and a healthier, more muscular and leaner body. If you’ve been looking into taking CellShock’s outstanding pre-workout formula N’SANE, you undoubtedly are looking to get the most out of your workouts. Why not get the most out of N’SANE itself? CellShock’s line of products are all designed to work in conjunction with each other, for optimal increases in strength, lean muscle mass and performance in both aerobic and anaerobic exercise. Ideally, you would want to stack N’SANE with N’RAGE, a premium blood flow enhancer that will optimize the delivery of your other supplements to the body and really provide a massive pump and vascularity, and N’FUZE, a concentrated dose of KreAlkalyn buffered creatine compound. By stacking these three products, you will get the most effective total dosage of each important compound and allow them to work with the others to their maximum potential. You will not only be providing your body with the formulas necessary to increase results, but also its ability to shuttle those formulas to the muscles. The result: Massive increases in power on explosive lifts, focus and intensity throughout an entire workout, and the ability to recover faster and come back better-prepared for your next workout. One thing you might notice between all three of these products is some overlap between the compounds — that’s why they work so well together. Both N’RAGE AND N’SANE contain L-Arginine AKG and the GlycoCarn compounds, but with staggered release timing and precise amounts of each, they complement each other to maximize the benefits of each formula. Likewise, both N’SANE and N’FUZE contain the buffered creatine product KreAlkalyn, but again, in different levels of concentration so your body can handle and use the most creatine possible over the course of your intense workout.